Sea Fox Boats are designed inside and out for durability and dependability on the water. They are known for their rugged construction proven in the fishing boats which are often driven hard. There's no structural wood in any Sea Fox. The composite-cored hull is supported by fibreglass stringers that are also bonded directly to the cockpit sole which creates superior strength and minimal flexing. In the transom, a glassed-in aluminium plate adds support around the engine mount. 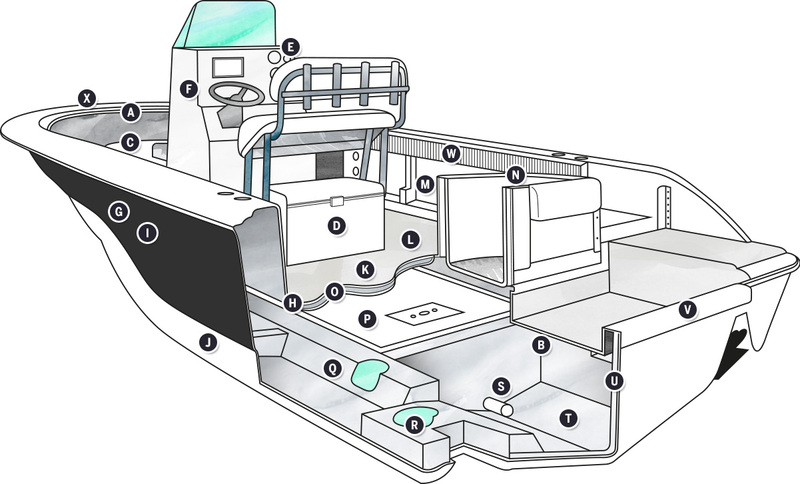 Closed cell foam is injected into spaces in the hull and deck providing positive flotation, while all-stainless hardware will stand up to the elements without demanding maintenance. Sea Fox boats are built to last both above and below deck and the Limited Lifetime Warranty shows strong confidence in our product. TAll composite materials. No wood, no rot!